I’ll give you a moment to catch your breath. That was scary, wasn’t it? I know it was for me. I’m a year away from applying, and even I can already feel my heart racing at the thoughts of applications and letters of rec and every other thing that compiles into the monstrosity that is applying for college.We live in a day and age where college is the be-all-and-end-all for high school students. Especially here at West Ranch. I love West Ranch, I really do, but we have a serious issue. We’re too competitive. If you have to stop and ask yourself “What’s wrong with that?” then you are most certainly part of the problem. Being competitive can be a good thing, sure. If you, Person A, took more advanced classes and had more extracurriculars than Person B, then you’ll get into college. Congrats. But when you get into, say UC Merced, which accepts 60.7 percent of applicants, and you’re talking to the kids in your Calc BC class, and the kid next to you got into Stanford, who accepts 5.1 percent of applicants, well… Doesn’t your good news seem kind of lackluster then? And don’t lie, isn’t there that resentment and rage making your stomach twist? And maybe you’re imagining it, but didn’t their voice just take on that condescending lilt that makes you want to throttle them? No? Then you’re a better person than me. Our generation, and West Ranch in particular, has way too much pressure on us to get into a good four-year university right out of high school. Some of us have different definitions of what qualifies as good, but for the most part, it’s consistent: Any of the UCs will suffice; you’re somewhat impressive if you make it into an Ivy; schools like Stanford and USC will be fine; and the Cal States… well, as long as you’re excited? If you get into a school outside of those parameters, but it’s your dream school, then whatever, as long as you’re happy. If you’re a sports person, then good for you; you got a scholarship to such-and-such. But never, under any circumstances, will you be looked at the same if you say you’re going to the dreaded College of the Canyons. There will be that immediate look of pity, followed by the assumption that you didn’t get in. You might be thinking right now, “Well, how do you know? You’re a junior!” How do I know? Because I lived through it before. My sister is very, very smart. No question about it. So when she got fives on the AP Lang, AP Lit and AP Psychology exams, it came as no surprise. She graduated, with honors of course, with the Class of 2016. She applied to the same schools you’re all applying to as well as the crown jewel of her list: UCLA. Sure, she applied to Stanford, and Berkeley, and the like. She got into some great schools, too! Cal Poly San Luis Obispo, UC Santa Barbara, and other schools that are on par with fantastic students. But UCLA was the school she decided she had to go to midway through her senior year, so she was sticking with it. Her decision to go to COC for two years and transfer into UCLA was, in the long run, a good thing. She’s there now as an English major with a history minor, and she’s happy. But I remember her describing to me the reactions of other people in her classes, or the look on distant family members’ faces when they heard her decision to go to community college. There was the poorly concealed pity, and certainly a tinge of disgust that someone as smart as her would go to community college. It’s pretty hard to forget that there was so much pressure on her, and by extension, us, that she never wanted to tell family friends and her peers where she was going to college. It’s not even community college that’s the major issue. The timeline that society’s set for ourselves right out of high school is what’s really problematic. We’re expected to get into an amazing four-year. We go there, we graduate, and maybe after, go to grad school. Then get a good job before we’re 30. Meet someone, marry, maybe have kids, all before 45. College admissions. 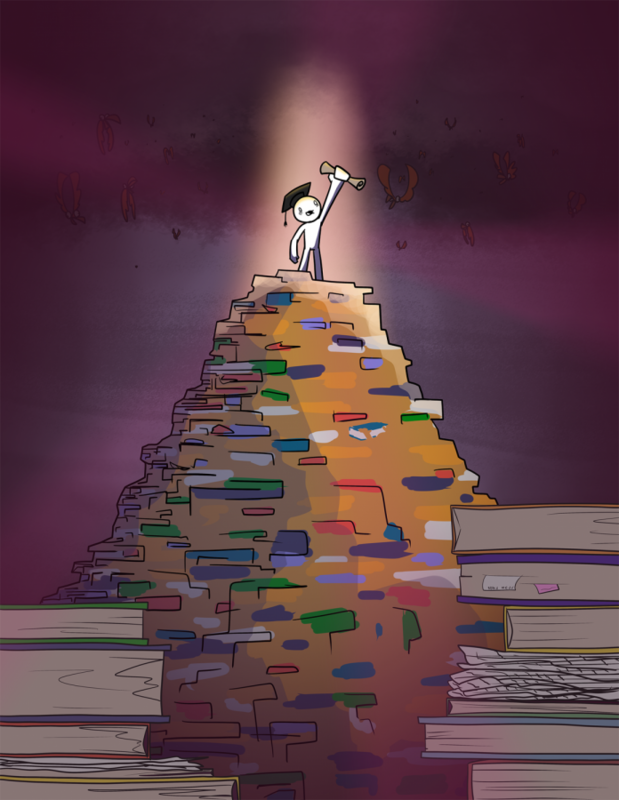 Another mountain of stress to tackle, and I’m not even there yet. Nowadays, schools are accepting fewer and fewer of their applicants. Being selective, I understand. And they can’t take everybody; that makes sense. Sometimes, you just don’t get in. With more and more people applying to college than ever before, it’s only reasonable that more people will get rejected. In an interesting article by Forbes, the author, Willard Dix, compares getting into college to a battlefield. He said: “In my last entry, I called students who apply to high status, low admission rate colleges and universities ‘cannon fodder.’ Charging ahead to breach the walls of these institutions has increasingly become an exercise in futility even for the best, most accomplished students. […] I return to this metaphor because of the damage done to students entering the college admission process. Those inculcated with the idea that only a high status college will do for their post-secondary lives must endure a four-year slog through high school to position themselves for a virtually impossible result. When they’re rejected, all that work seems to have been for naught. They have lost their four years of high school pursuing a fruitless goal, with the end results being cynicism about the system, regret over lost time, mental and physical exhaustion, and a feeling that studying and being active don’t really matter.” Oh how true this is. Unfortunately, the stress we’re under has next to no benefits for us in the long run. Yeah, you might work harder, or it can motivate you to volunteer or start a club or all that other good stuff that colleges eat up. But what about the health effects? The anxiety? The depression? The heart issues, the problems with your immune system? News flash: If you’re feeling or have been diagnosed with any of these, that’s something you might want to be concerned about. It’s no wonder we’re so stressed! We want to avoid community college at all costs, we’re pressured to get into amazing schools that take only the best students, and there’s an absolutely ridiculous timeline that we feel we need to follow to a tee. There’s an NPR article titled, rather ironically, “School Stress Takes Toll On Health, Parents and Teens Say.” They’re not wrong. But there’s an underlying issue here. We’re aware that stress is taking a toll on our health. Adults, trust us, we know. Some signs are hard to miss. But most of us don’t miss school if we’re feeling sick. Most of us will do our homework anyways, or tough it out at school because dare you miss AP Physics. And if you’re coming to school sick, thanks a lot, because that can get other people sick, too. A lot of teachers have hand sanitizer in their classes for a reason. Our society’s views about college are nothing short of absolutely toxic. And this toxicity is affecting all of us. Seniors, you’re panicking about college admissions all while doing whatever you can to keep your grades up with the thought that “Once they’re turned in, I can finally relax.” But the reality is, you can’t. Juniors, I see us scrambling to take the PSAT, and the real SAT, and some of us even the ACT. We spend our free time volunteering, going to SAT Prep courses, and doing whatever we can to make ourselves look like a gold star sticker on a blank sheet. And even sophomores and freshmen! I don’t know about now, but even then I had the mentality of: “Will this look good for colleges? I have to do it then.” Truly, our generation’s view on college is poisoning us, both mentally and physically. And I, for one, am sick of it. In the long run, is it worth it? Wanting to excel in school, that’s a perfectly understandable goal. I know I want to. But working for years to get into an Ivy League that has rising dropout numbers anyways, how much are you willing to sacrifice? What about the physical, mental, and emotional toll it will take on you? On the very morning I write this, I woke up sick to my stomach with stress: I have a midterm that I’m sure I’ll fail and a test today that I’m not prepared for, unfinished homework from yesterday that I need to get help on, I’m not going to have time to do homework tonight, plus other outside stressors. Stress affects everyone differently, but that never means it’s healthy. According to the American Psychological Association, some of the ways stress can affect your body include “trigger[ed] asthma attacks, hyperventilation which can lead to panic attacks, long-term problems for the heart like hypertension (which can lead to heart attacks or strokes), problems with your liver and kidneys, and issues with your gastrointestinal tract.” Even your nervous system can react to stress! With all of these negative side effects, shouldn’t your goal be to become less stressed? I understand that our society is at fault for shaping the positively deadly way we perceive our futures, whether it be regarding college or beyond. That is why I call upon you, West Ranch, to start changing this. This year and beyond, let’s make it our goal to stop and realize that it’s ok to fail. It’s ok to not make it into Harvard, and no one will judge you later on for going to community college and transfering to another great school. It’s ok to take a step back and realize that you actually don’t want to join that club, no matter how good it will look. There are so many things we can do to help our generation, but we have to begin by challenging the preconceived notion that college is the be-all-and-end-all for the rest of our lives. Once we do this, we can work on helping our generation become less stressed, and not only about college applications. Teachers, district officials, mental health is an issue, but our mental health would be so much better with less homework, so we have more time to spend on those applications. And maybe we add a semester long class dedicated solely to filling out college applications, where we can bring in experts to help us. Parents, siblings, aunts, uncles, and distant relatives, stop pressuring us to go to the best (and most applied to) schools in the country. COC and CSUN are fantastic options, and we’d be saving a lot of money for the same education. In the real world, barely anyone will care where you went to school, so long as you’re qualified for the job. And what can you do? For the remainder of the year and the future, live for yourselves, not for your college of choice.